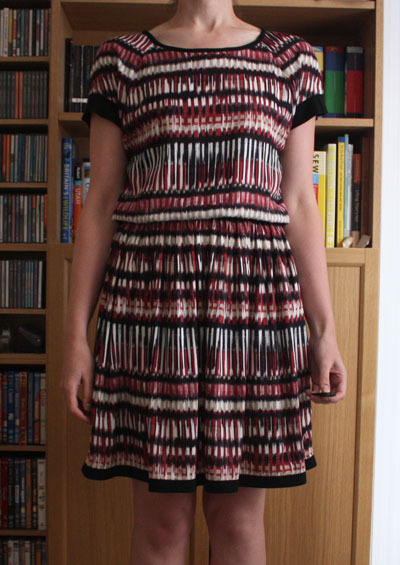 First up, a dress that I’ve been imagining/planning to make for some time. 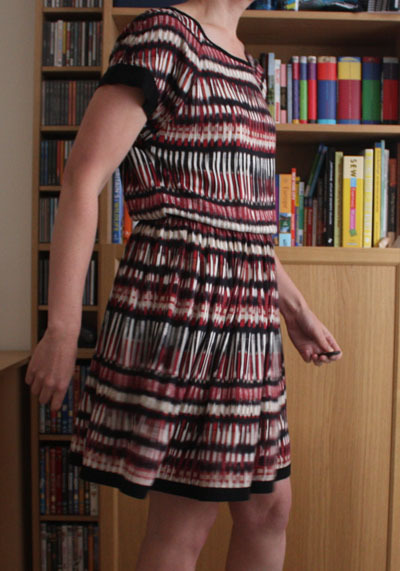 If you’ve been following this blog for a while you’ll know that I’m a fan of the Sewaholic Belcarra blouse, having made five to date and was keen to try adapting it to a dress. 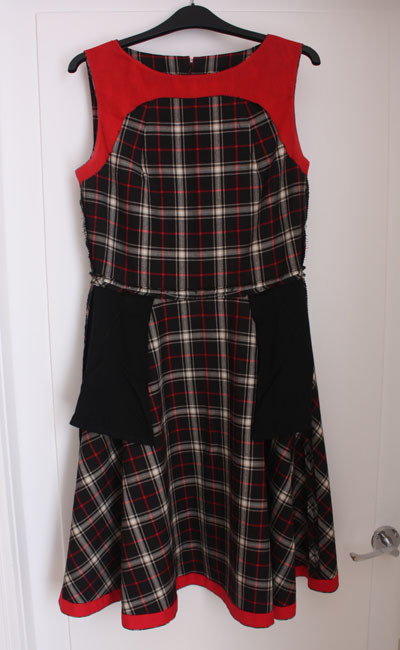 I debated between lengthening the pattern pieces into a kind of A line shift dress and this adaptation of adding an elastic waistband and gathered skirt, which I felt would work better with my fabric choice. The main fabric is a lovely viscose from Minerva crafts (although I’ve also spotted some other suppliers selling it too). 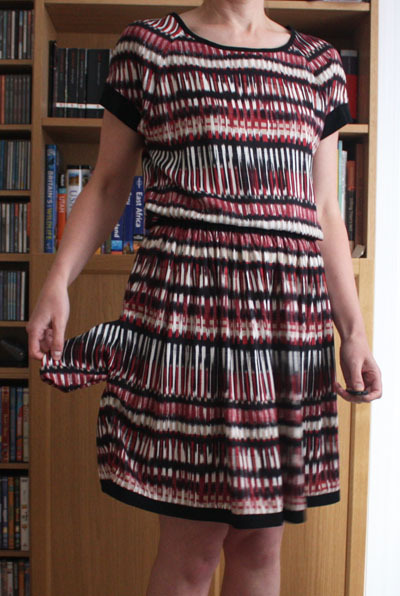 With the stripy design I thought a rectangular gathered skirt would work well. The black fabric is also a viscose from Minerva, that I’ve used in a few makes. 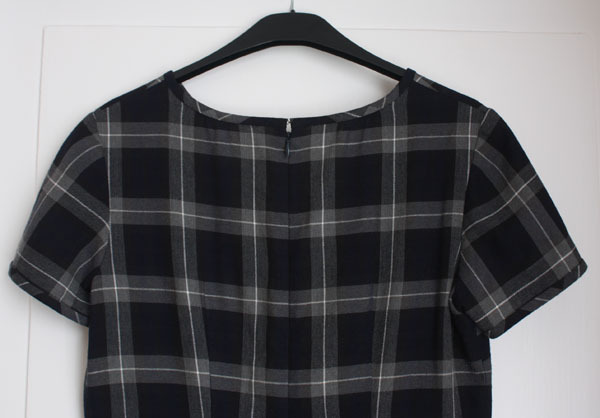 To convert the pattern to a dress I shortened the top length to a couple of inches lower than my waist (because I want to create a blousey effect) and squared off the side seam. For the waistband, I simply cut two rectangles the same length as the waist and 5.7cm wide (so the finished waistband is 2.7cm once the seam allowances are sewn up) to make a casing through which I inserted 1 inch wide elastic. I then ran into a bit of an issue as I realised I didn’t have enough fabric to make the width and length of skirt that I had in mind if I also wanted to ensure the stripes matched. 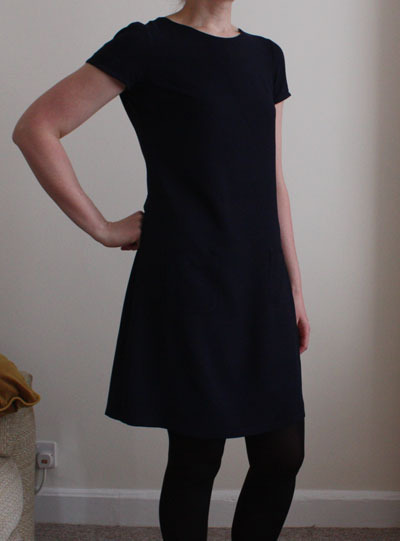 I umm-ed and ahh-ed for a little while and then decided to go shorter than I’d intended, but add a black hem band to give a bit more length. 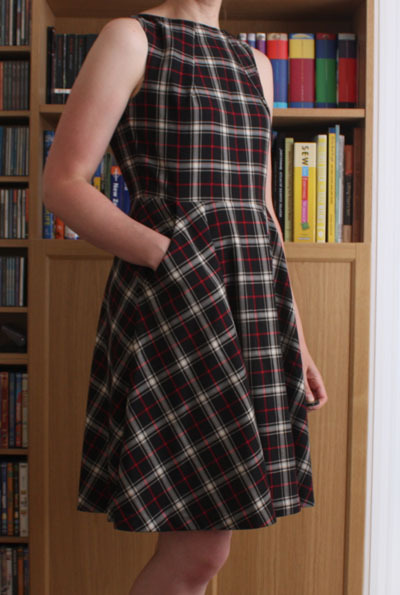 I actually think the black hem band nicely balances the design 🙂 However, I was so focused on making the most of the fabric that I had that I ended up cutting a pretty wide skirt and it wasn’t until I’d sewn it up with the pockets that I realised I’d probably gone a bit over the top with the width! By this point I really couldn’t face unpicking everything (I’d used french seams for everything, including the pockets) so decided to try it as is. In these photos I think the dress looks fine and the fabric is drapey enough that the wide skirt looks ok. However, the first day I wore this out was pretty windy and with the light and wide skirt fabric I felt like it had a tendency to blow up a bit too much so I mostly had my hands anchored into the pockets to keep it under control! The jury is still out on how much I like this dress, its not as flattering as I’d hoped and there are certainly a few things I’d do differently if I made it again. 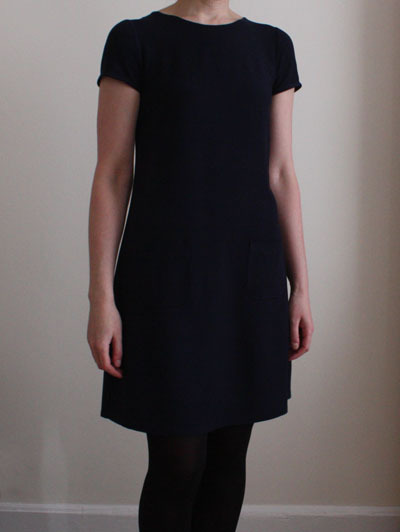 But it is still a nice light and comfy dress for warmer weather, just so long as its not windy! Back in January I went to the Pattern Cutting Weekend class at Ray Stitch taught by Alice Prier and thoroughly enjoyed it! Day 1 was making our custom fit blocks while on day 2 we got into the details of cutting patterns. Alice really knows her stuff and I came away super inspired with lots of ideas. 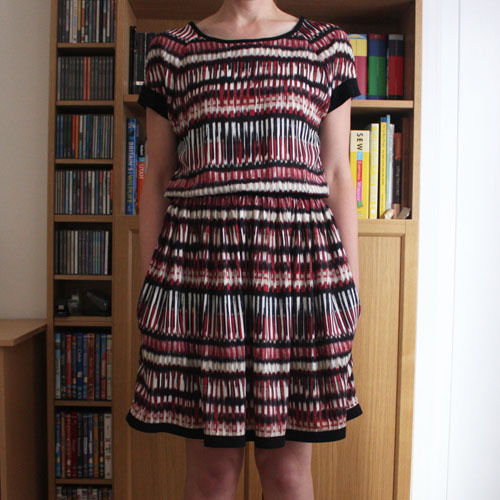 And viola, here is the first dress that I cut from my block! I brought the fabric at Ray Stitch the weekend of the class, it is a mix of viscose and polyester and I was really drawn to the plaid. 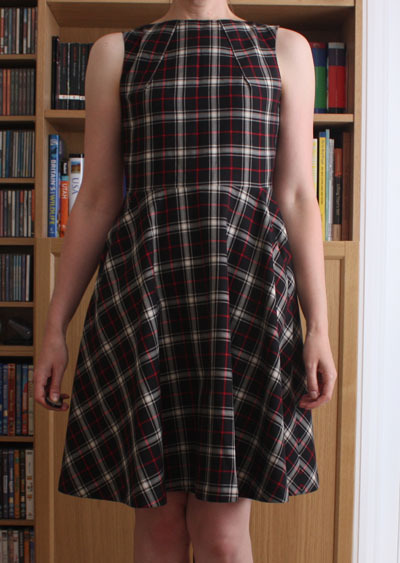 After the success of my plaid Laurel dress I was keen to have another go with some plaid. When I brought the fabric, I was leaning towards making a skirt so I only brought 1.5m. However, after a bit of time to ponder, I wanted to use this for a dress. 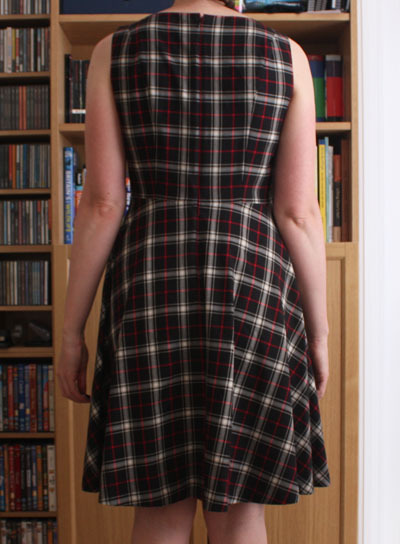 The dress was inspired by one I saw on Modcloth – I really liked the effect of the neck pleat with the plaid fabric. 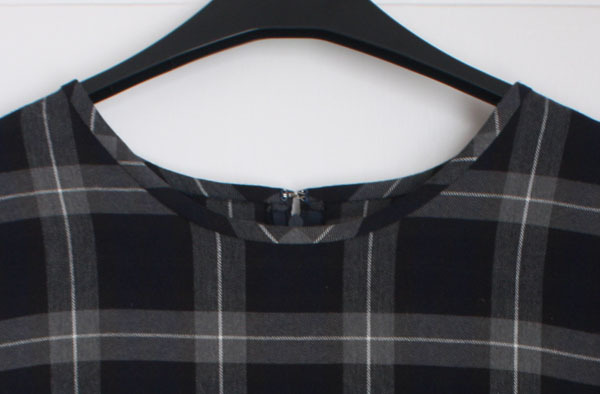 I calculated the position of the pleat such that when sewn up it would be parallel to the vertical line of the plaid. Although I originally planned for the shaping to be a simple folded pleat, when made it up I felt there was too much volume above the bust so I stitched it down more like a dart, but not all the way to the point so there is still a bit of movement and give there. The back bodice is princess seamed and the closure is an invisible zip down the centre back seam. I debated for a while about the skirt – a pleated rectangle or some variation of a circle skirt. Turned out that only having 1.5m of fabric made the choice for me! 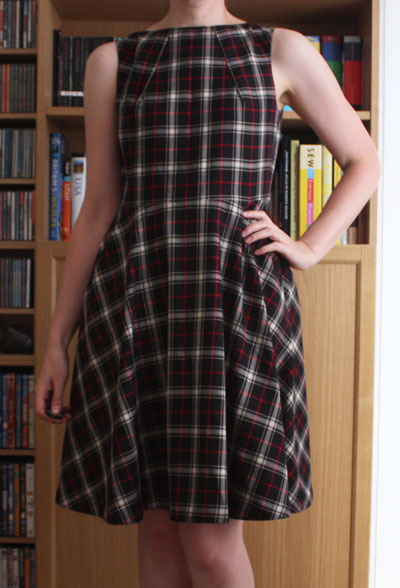 All I could fit was a half circle skirt, but I’m pretty happy with this. 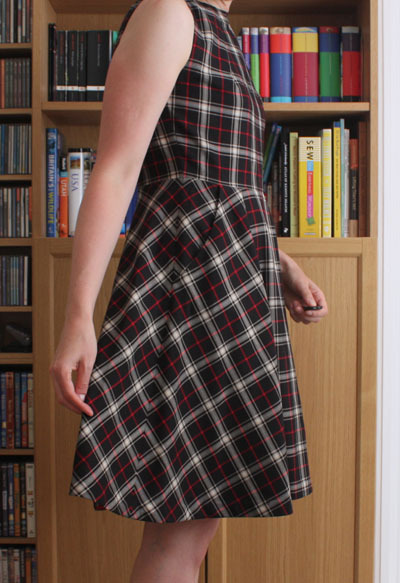 I took my time cutting this out so that I could center and match the plaid – I feel like I was pretty lucky to be able to do this so well with my limited fabric. I particularly like the way the plaid matches up in a diamond pattern on the side seams of the skirt. Of course I had to add pockets to the design! Fabric limitations meant that I needed to use a different fabric for the pocket bags. So I used some black viscose that I had in my stash, which works well as it is lighter than the main fabric and drapes out of the way. The neck and armholes are finished with an all in one facing. I used red cotton for a splash of colour on the insides. Then to match, I used some red bias binding from my stash for a hem facing that I finished with hand stitching (all 3m of it!). I made a couple of toiles of the bodice, which was just as well as they showed a few fitting adjustments that I still need to make to my block. Once I’ve done that, I’m very excited to be able to make lots of different designs that (hopefully!) will require minimal or no fitting adjustments. 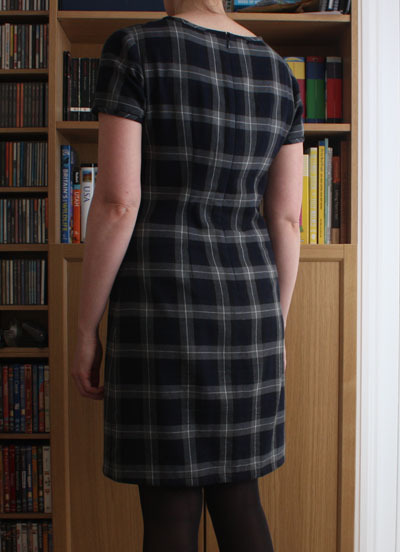 I’ve been admiring plaid dresses for a while now with the desire to make one myself, so after the success of my first Laurel dress I dived straight into another with this cotton and viscose blend from Minerva Crafts. 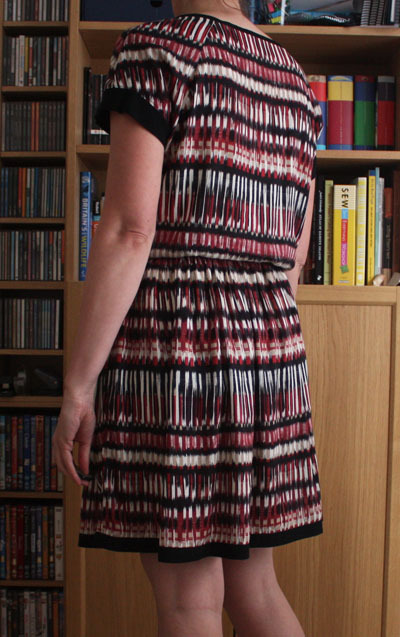 I think the fabric has a great combination of weight and drape for this style of dress so I’ll definitely keep an eye out for other cotton and viscose blends in the future. I have to admit I can be a bit of a perfectionist which I did have to be conscious of at times. 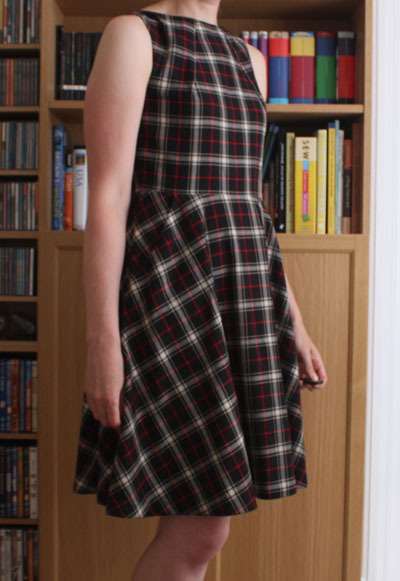 Part of the enjoyment for me of making this dress was working through the plaid matching and placement, but I also tried to make sure I didn’t get too obsessed with it and there were a couple of occasions where I stepped away from the dress for a day to two to check if the mismatch I was seeing was really worth unpicking and redoing! The neck binding did get unpicked and redone. Cutting out took a lot longer than usual due to getting the plaid placement and symmetry right. But I’m pretty pleased with how it all turned out and think it was worth the extra effort. I found the plaid layout diagrams in this post by Really Handmade very useful. With my first Laurel I used the bias binding as a facing but with this one I wanted it to be a feature so sewed it on as binding as per the instructions. For the back neck, I didn’t want to break up the plaid with a dart so I gathered the neck into the bias binding instead. I had expected the gathering to be visible, but actually with a bit of steam the fabric pretty much eased itself in giving a smoother neckline than I’d expected. The other change I made was to make the pockets a little bigger so that they were the width of two inner squares. I also like the bigger pockets for practical reasons so will likely stick with this size for future Laurels. 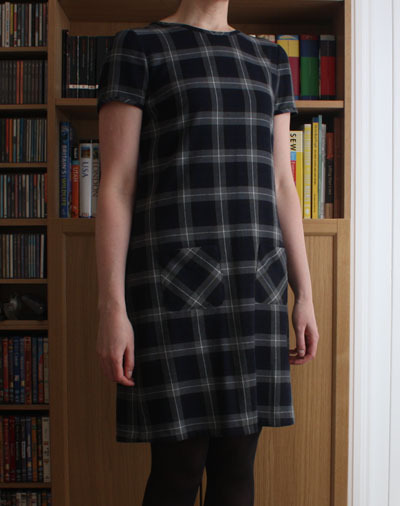 As I had plenty of fabric I cut out a couple of pocket plaid placement options to try out against the actual dress – one centred on an open square (my final preference) and the other centred on an intersection. So again, this was not a speedy sew! The binding and hem are all sewn by hand, which I quite enjoyed and think it was worth it for the look of the uninterrupted fabric design. The dress has a had good amount of wear already and is very comfortable. It works well with both under and over layers in the winter or on its own now that spring is finally here. 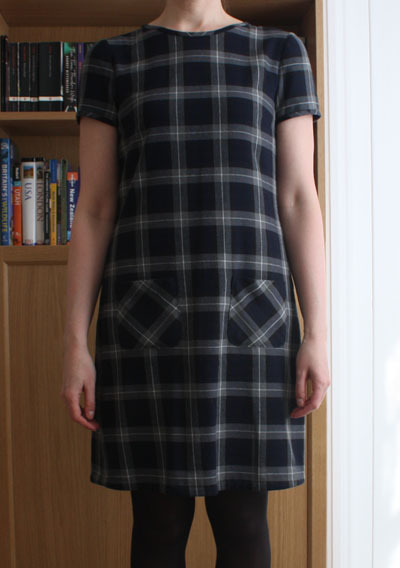 All in all I’m very happy with my first plaid dress and doubt it will be my last! Have you sewn with plaid? Do you enjoy taking time over matching or prefer a quicker sew? 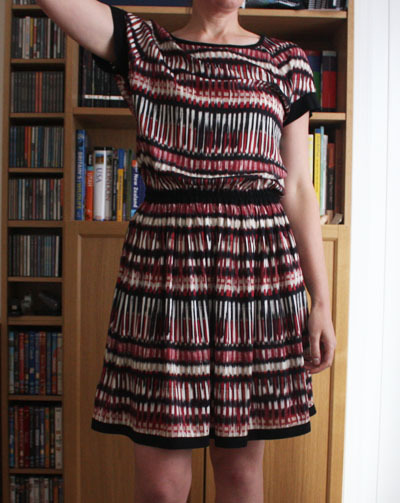 Can you believe I’ve been sewing for around two years and this is the first dress I’ve made?! There have been a couple of false starts in the past (with patterns from Simplicity and McCalls) where the scale of fitting issues I was facing made me take a break for my own sanity, but I never got back to them. This time however, I used the Colette Laurel which allowed me a little head start as from my previous Colette makes I had an idea of some of the adjustments I’d need to make (lengthening and small bust adjustment). Sure enough, the toile was nearly passable for wearing so I went straight to “proper” fabric with my second round of adjustments. 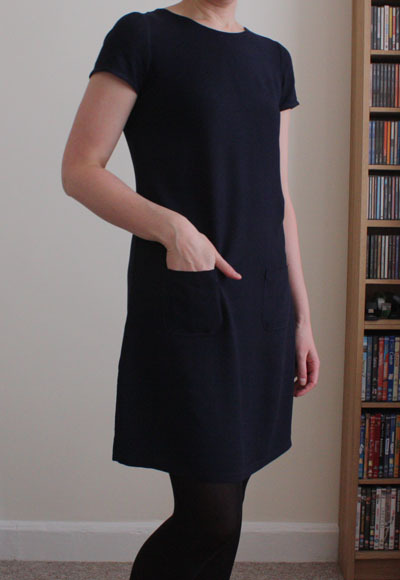 I used a metre and a half of this navy blue viscose from Minerva Crafts so at £6 it wouldn’t be breaking the bank if it didn’t turn out great. I have to say I’m very happy with the result! I think this is a great easy to wear style, suitable for both work and an evening out. I don’t wear dresses very much (in part due to difficultly finding ready to wear ones that fit my tall frame), but when I do I tend to feel very put together. But it didn’t feel too onerous as some of them were done while sewing up – deepening the waist darts and adding the back neck darts. Since this fabric is more drapey than the old cotton bedding I used for the toile, the neck darts were especially needed to stop the dress sagging into a hunchback shape. Also worth mentioning, these are my first set in sleeves! I took my time and hand basted the sleeves before sewing, which was totally worth it as there is not a pucker in sight.